Your license key (to enable automatic updates). Page selection for important Restrict Content Pro features. Your license key must be entered and activated in order to receive automatic updates inside WordPress. » Read the guide for finding and entering your license key. When you install Restrict Content Pro, the plugin automatically creates a few important pages for you, as shown below. Each page (with the exception of "Success Page") requires a specific shortcode. 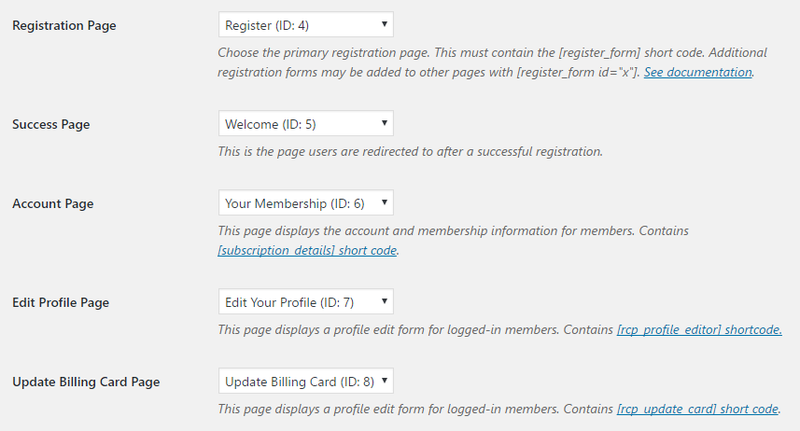 For example, the "Registration Page" should contain the [register_form] shortcode. This is done for you with the pages that were created automatically on installation, but if you choose to edit or change the page selections, make sure they have the required shortcode in the post box! Registration Page - The page that contains the registration form. This is where users sign up for a subscription plan. See [register_form]. Success Page - Customers are redirected here after they successfully complete a registration. Account Page - Displays information about the current user's account and membership plan. See [subscription_details]. Edit Profile Page - Contains a form allowing users to edit profile information, including their display name, email address, and password. See [rcp_profile_editor]. Update Billing Card Page - Some payment gateways allow subscribers to update their billing card details if auto renew is enabled. This form allows them to do that. See [rcp_update_card]. There's a dropdown for configuring your auto renewal preferences. This is explained in detail here. If you select "Let customer choose whether to auto renew" then a new option will appear allowing you to specify the default state (auto renew checked on, or auto renew checked off). This message is shown when a user tries to view a post/page that they do not have access to (if their account has expired or if they don't have the required membership/access level).